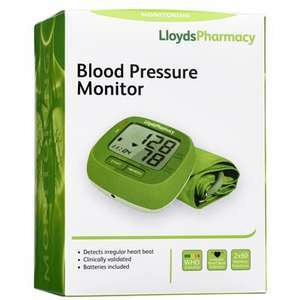 Blood pressure monitor and cuff from Lloyds Pharmacy for just £14.99 collected (free C&C). Add voucher code OWN25LP in checkout to receive a £5.00 discount! Better to be safe than sorry if you’re concerned about your blood pressure and for the price, it’s worth having one to hand. My uncle had that yesterday through to today and didn’t enjoy the experience either. Ironically he’s actually bought this too, just for peace of mind at home. Seemed like a pretty good price. Saw another blood pressure monitor on here for £19.99 and this is 25% less, so if you’re in the market for something like this, it’s the best price around I think? Yes, think the Omron one can be bought for £19.99 at the mo, although this also seems good as it’s medically certified too. Buy this one first as a good price and then if you want another " more advanced " model later you could always use 1 against the other to calibrate and take an average of the 2.